From the days of Eusebio, many African footballers have cast their spell on various European leagues through their raw passion and great skills. However the first lot of African footballers generally consisted of supremely gifted strikers and followed by the emergence of robust defenders. It was much later with the advent of playmakers and midfielders, the likes of Jean Tigana that the African footballers’ amalgamation into the top flight soccer leagues was completed and it is here that this story may remain incomplete without mentioning one of the best midfielders of the last decade a certain Michael Essien. 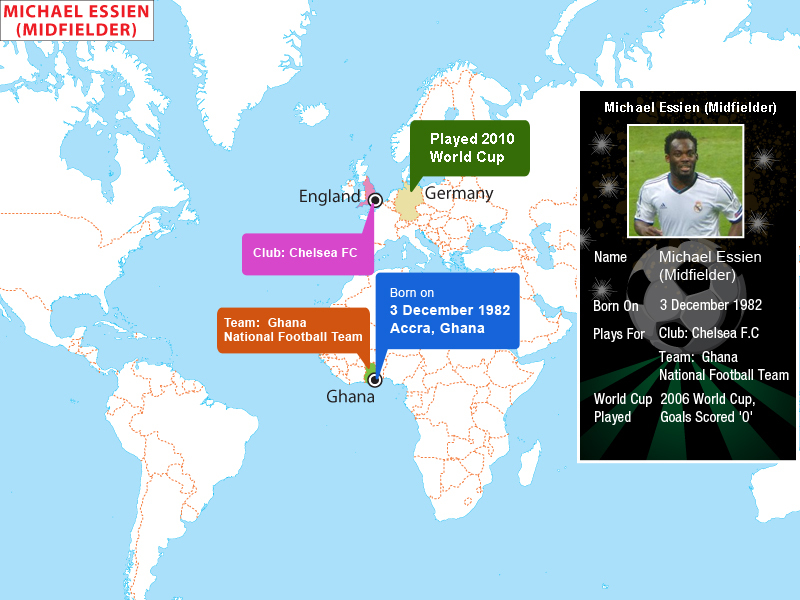 Essien was born in the capital city of Accra in 1982 to Aba Gyandoh and James Essien. After graduating from St Augustine College, Accra he started his career with the local outfit called Liberty Professionals FC. Soon he was being compared with the great Patrick Viera for his box to box playing ability. However his trial with Manchester United was not fruitful and in July 2000 he joined the French club SC Bastia as a defender. Essien’s debut as a midfielder came following an injury to his Bastia teammate and he was highly impressive in that role. In July 2003 he moved to Olympique Lyonnais which was regularly topping French Ligue1. Essien started off as a defensive midfielder and it was only after his move to Chelsea and EPL in 2005 that Essien got into his new role as a box to box midfielder. Essien delighted his numerous fans with his crafty playmaking skills. He soon endeared himself to the Stamford Bridge fans with his robust midfield play and occasional strikes. In 2012 he was loaned out to real Madrid before a formal transfer deal saw him donning AC Milan colors in January 2014. His international career for Ghana started off in 1999 in the under-17 FIFA championships in New Zealand. His debut for the senior team came in 2002. 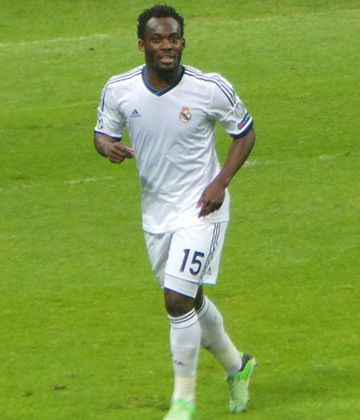 Essien was a key member in the midfield along with Stephen Appiah in 2006 World Cup. During the course of 2008 African Cup he was a made the skipper of Black Stars and came with a memorable performance. However, due to an injury Essien sat out of the 2010 World Cup. A toast of African football Essien has been bestowed with plethora of laurels in his career. He won the French Ligue 1 for Olympique Lyonnais in 2003-04, 2004-05 followed with the coveted EPL title along with Chelsea in 2005-06.Essien had topped this with FA Cup wins for Chelsea in 2007, 2009, and 2010. He also won the 3rd position in the African Cup of Nations in 2008 and a runner-up medal in 2001 World Youth championships. He was voted as the 2005 French player of the year while BBC African player of the year in 2006-07 and in the same year was declared as the Chelsea Player of the season. Essien is known as 'Bison' by his team mates a tribute to his tough defensive style and hard tackling ability. A highly revered figure in the soccer circles he remains a very sought-after attacking midfielder. A celebrity in his own country, Essien is now married to the Ghanaian actress, AkosuaPuni, and both are proud parents to two playful kids. Earlier Essien was known to be particularly close to another actress Nadia Bouari before their break up. Essien has been a great servant of soccer. His famous Game of Hope foundation continues to find friends and followers for the less privileged children in Africa while his dazzling skills have lit many soccer pitches alight with his sublime skills. He belongs to the special generation of African players who have enthralled the global audiences while playing at the highest level of professional soccer.